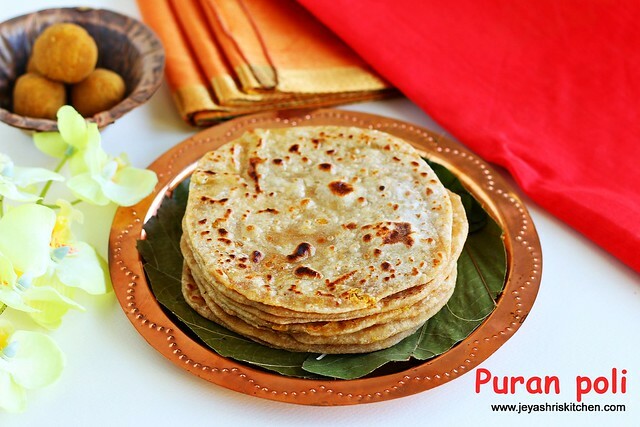 Maharastrian puran poli is a traditional festive sweet made using wheat flour and chana dal stuffing. I have already posted the south indian Poli recipe. As i have many Maharastrian friends around, i have tasted this many times, but never attempted to make it at home. 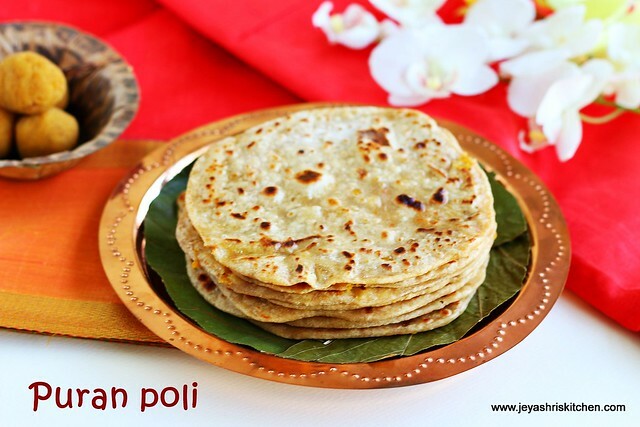 Since today is Ugadi and Gudi padva, i thought i will try and post the recipe of maharastrian style puran poli. It is similar to a sweet paratha but the stuffing inside tasted so well. Since the outer cover is made with wheat flour, it is healthy to give this to kids too. Wish all readers a Happy Ugadi and Gudi padwa. Traditionally Maharastrians make using channa dal for stuffing and gujaratis use toor dal for stuffing. I used both the dals in this recipe. Soak the toor dal and chana dal for 30 minutes. Cook this in a pressure cooker till 3 whistles. Add 1/2 cup of water to the dal while cooking. Drain the water completely after cooking. Put this in a strainer for 10 minutes so that the water will drain out completely. In a wide bowl add the whole wheat atta and add a pinch of salt. Add milk and ghee and little water as needed to make it a smooth soft dough. Grind the dal into a fine paste in a mixie. This will be bit dry only. Do not add any water while grinding. In a pan 2 tsp of ghee in a pan and add the ground dal. Add the powdered jaggery and cardamom powder. After adding the jaggery it will become bit watery. Do not panic, cook this for 10 minutes in a medium flame, it will come to a thick whole mass. Allow this to cool completely and make it into lemon sized balls. Make the dough also into equal sized balls. Actually the dough came for 8 sweet balls. Four sweet balls were left, you can knead some more atta to make use of the poornam or you can have as it as too. Dust the dough ball with plain flour, dusting with atta will not give a smooth texture to the poli. Place one ball of dal stuffing in the center and cover this, as we do for aloo paratha. Roll this gently into a roti. Do not add more pressure while rolling. Heat a tawa and place the rolled poli on the tawa. Cook this on both sides. Drizzle some ghee on the tawa and cook it for few more seconds. Be careful not to get this burnt. Only channa dal or only toor dal can be used instead of mixing both. Do not cook the dal with more water or do not over cook too. Always drain the cooked dal before grinding it. Nutmeg powder(jaadikaai) can be used instead of cardamom powder. Use maida for dusting the polis while rolling. This will give a smooth outer layer of polis.